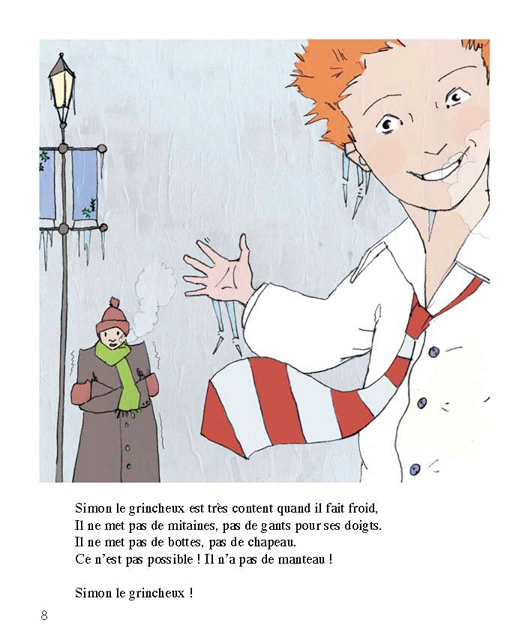 Simon is a somewhat peculiar boy who loves rain, snow, sleet and wind, and despises sunny, pleasant weather. One day he is swept up into the air by a ferocious hurricane. As he is flying through the sky, he notices a baby that has also been caught up in the wind. Risking his own safety, he rescues the child and returns him to his mother. He is heralded by the villagers as a hero. Simon le grincheux becomes Simon le généreux ! This book is written in verse.